There is reason to be cautious about smelling a berry flavoured beer. Often the nose is unbearably sweet. Luckily this is not the case with Black Betty. It is pleasantly blackberry with a hint of spice. This beer is not overly carbonated and the medium-light body ends with a slight sweet berry linger. 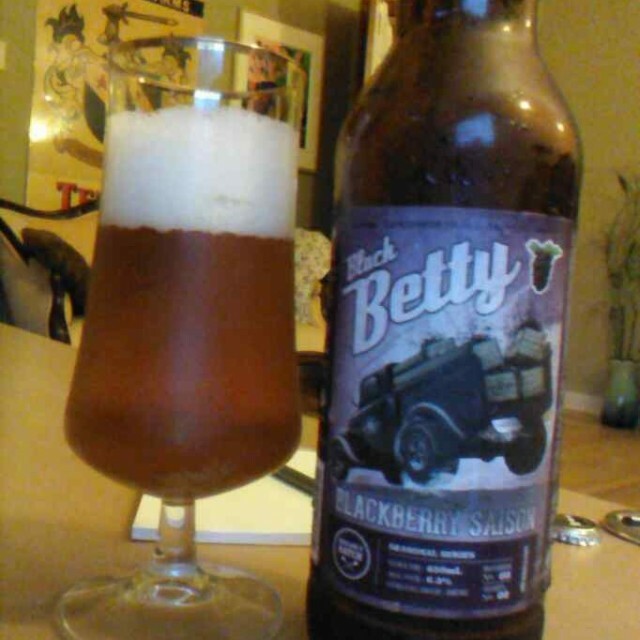 Black Betty's flavour is as described, a nice balance of berry sweetness, cracker malts with a hint of spicy yeast character. This is not a flavour powerhouse but just a nice brew. Food Pairings: Restrained enough to go with any meal. Would go nicely with a fruit flan desert. The berry flavours will resonate and the carbonation and alcohol will lighten the heavy creaminess of the flan. A good cheese option would be a chevre mixed with berries. Even better, put that goat cheese on a mixed greens salad and toss with a berry vinaigrette. Cellar: Nope, drink it fresh. Fall has arrived, GCBF is a distant memory so our spirits need to be lifted. The best way I know how is to supply great craft beers. We are in for a treat this month; the name for this beer school is "They will dry hop anything!" All hoppy beverages this time; notice that I did not say beer. There will be almost 1000IBUs at our table. 6. If we sell out, I'll grab an extra hop bomb for fun. As always you are there to learn. There will be history, glassware lessons, food pairing suggestions, a cheese plate to nibble on and prizes. The same format as always: bring a pen, your palate and $20. Email me or leave a comment to reserve your spot. There will be only 20 spots for this event. Do not delay as these schools fill up quickly.. Please forward this to any other craft beer loving friends who might like to attend. As always plan for a safe trip home. The flavour profile of beer can be thought of the balance between sweetness and bitterness. Dopplebocks are closer to the sweet side, while IPAs drift toward the bitter side. Sweetness is provided by barley malts and bitterness is often provided by hops.This is not the case with the gruit style of beer. Before the regular use of hops, herbs and spices provided the countering bitterness and preservative properties need to enjoy a low alcohol, fermented beverage. We rarely get to sample beers where herbs and spices play a significant role in the flavour profile. This is why everyone should try the Saturalia Gruit. From the start you know this brew is going to be different. Peculiar aromas of sweet herbals, burdock and licorice rise from this tar black beer. Things get off-setting at the first sip; this beer is assertively tart and sour. Not in a lambic way, more of a digestive bitter angle. Other odd flavours of burdock, licorice fern and cinnamon swirl around an indescribable herbal sweetness. The finish is sour, dry with a long linger. 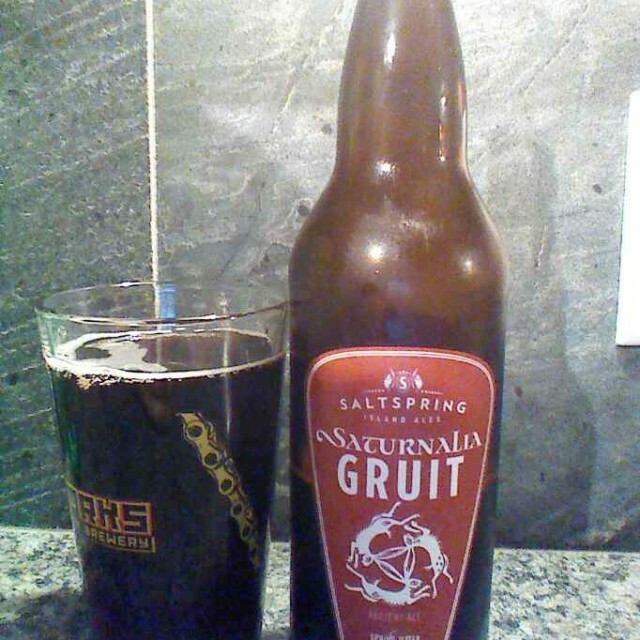 The gruit is not for everyone, but if you like sours you will like this one. It reminds me of those burdock and dandelion sodas you find in British sweets shops. Glassware: Whatever you have is fine. I would have used a stretched tulip. Food Pairing: Good luck. Something quite sweet and spicy would resonate nicely. Perhaps toffee pudding with a hint of brandy. Cellar: This might be a fun one to try, sort of a risk though. If those herbals flavours fade this will be one syrupy sweet beer.